An ECS instance can only be authorized to one instance RAM role at a time. 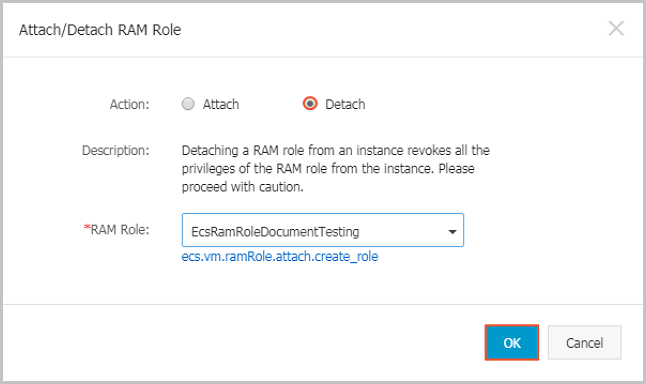 After an instance RAM role is bound to an ECS instance, if you want to access other cloud services (such as OSS, SLB, or ApsaraDB for RDS) from applications within the ECS instance, you must obtain the authorization credential of the instance RAM role by using Metadata. For more information, see obtain authorization credentials. You must have activated the RAM service. See activation method to activate the RAM service. In the left-side navigation pane, click Roles. Select Service Role for Role Type. Select ECS Elastic Compute Service for Type. Enter a role name and description, for example, EcsRamRoleDocumentTesting. In the left-side navigation pane, click Policies. 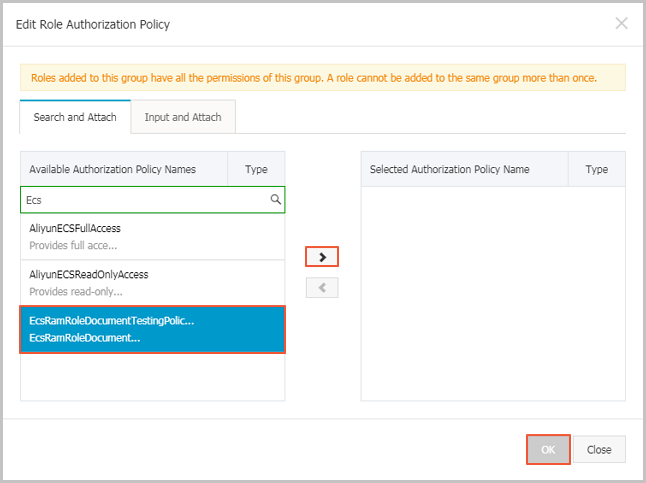 Select Blank Template for authorization policy template. Enter a Authorization Policy Name and Policy Content. In this example, they are EcsRamRoleDocumentTestingPolicy. 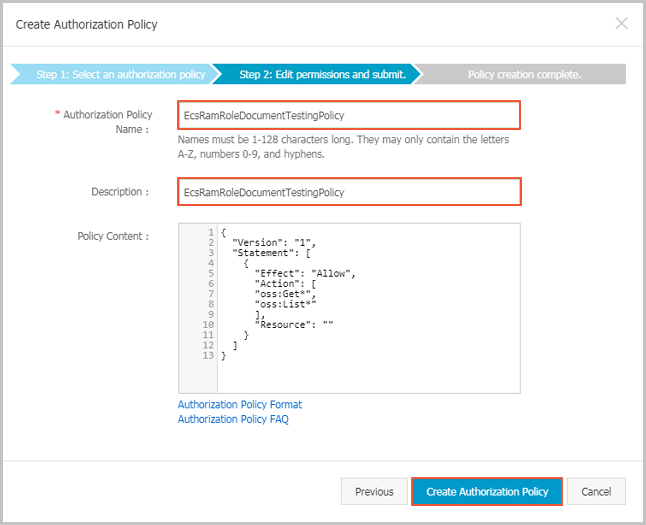 Note For information about how to write the authorization policy in JSON format, see policy syntax structure. Select a role, for example, EcsRamRoleDocumentTesting, and click Authorize. Enter the Authorization Policy Name and select it from the drop-down menu. In this example, EcsRamRoleDocumentTestingPolicy is selected. 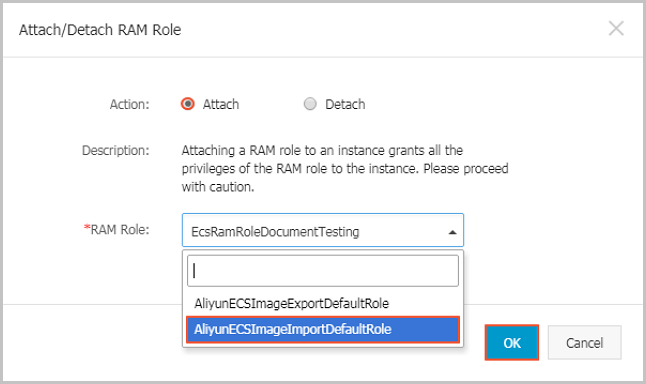 Click the icon > to select the policy name, and then click OK.
Find the target ECS instance and select More > Instance Settings > Bind/Unbind RAM Role. 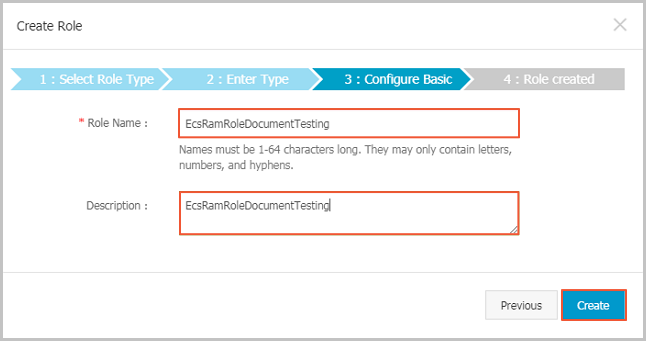 Select Bind for Action, select a role (for example, EcsRamRoleDocumentTesting), and then click OK. Select Unbind for Action, and click OK. Select Bind for Action, select another instance RAM role in the list of RAM Role, and then click OK.
Connect to the target ECS instance. For a Linux instance: run curl http://100.100.100.200/latest/meta-data/Ram/security-credentials/EcsRamRoleDocumentTesting. For a Windows instance: see Metadata. Note You must grant the RAM user with the PassRole permission to use the instance RAM role feature. Without the PassRole permission, a RAM user cannot carry out the permission of the authorization policy that is attached to the RAM user. The parameter [ECS RAM Action] indicates that a RAM user can be authorized for certain actions. For more information, see authorization rules. Click the following link to learn how to use the instance RAM role by calling APIs. Click the following link to see how to access other cloud products by using the instance RAM role.